It’ll soon be April and that means it’ll soon be time for the A-Z in April Blogging Challenge! The challenge is to post on your blog every day in April bar Sundays. Once you forget about the Sundays, that gives you 26 days in April which matches with the 26 letters of the alphabet. So on the 1st April you write about something beginning with the letter A, on the 2nd something beginning with the letter B and so on and so forth. After feeling like the challenge became a bit of an effort (and not in a fun way) for me last year, I was unsure whether or not I’d take part again this year. 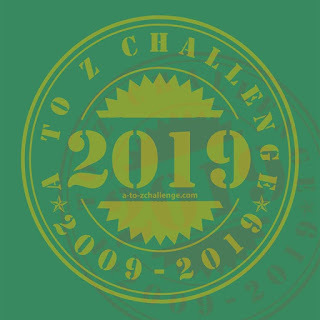 But after thinking about it, I’ve thought of a theme I know I’ll enjoy writing about and the A to Z in April Challenge is like a tradition on my blog now and it’d feel weird not doing it. This year all my posts in the challenge will be about my favourite characters from the Marvel Cinematic Universe! Each day will be about a character whose name (first or last) starts with the corresponding letter. I’ve figured out which character is going to be with which letter, though I will say in the case of a couple of them, they’re not necessarily my favourite but their names fit with what I needed. That being said, they will all be characters I like to varying degrees. For a previous A to Z in April Challenge I blogged about my favourite characters in general and mentioned a few MCU characters there. I’m going to try and avoid mentioning them again this year so it’ll be something completely new. I’ll still be posting my usual book and film reviews in April they’ll just be a lot of MCU characters making an appearance too. Do you think your favourites will be featured next month? If you want to find out more about the A to Z in April Challenge visit the website (there’s still time to sign up!) and you can see what I’ve written about for the challenge on previous years here. I love the theme! I grew up without Marvel comics (the downside of being born in a wrong time in a communistic country), but as an adult, I fell in love with MCU, so I’m definitely looking forward to reading your posts. Thanks! Wow that’s interesting! Yeah I never grew up with the comics or anything, my introduction to superheroes was through films and the animated TV series from the 90s.